Joel Greene here from Condo Hotel Center. Today I’ll be telling you about a parking garage. Yes, you read that right. And no, I haven’t lost my mind (although my kids might tell you otherwise). Actually, the parking garage is just one aspect of this exciting, new property. But it’s so darn cool, I couldn’t help but feature it front and center. BrickellHouse is a downtown Miami, to-be-built condominium tower. And everything about it will be high-tech, starting with the parking garage. BrickellHouse will feature one of the nation’s first effortless, fully-robotic automated parking garages. There’s no need to drive level by level to get to your parking spot. You simply drive into the convenient parking terminal. Get out and lock the car. Robotic Parking Systems safely places it inside the building on a shelving system. You get premium valet parking without the valet! This system yields convenience and security, as well as environmental benefits. The building’s carbon footprint will be reduced by 30% of a similarly-sized building. Plus, the space savings leaves more room for other amenities and common areas. Let me tell you a bit about those and the many other wonderful features of BrickellHouse. BrickellHouse will be a $170 million development featuring landmark architecture. BrickellHouse will be a 46-story tower. 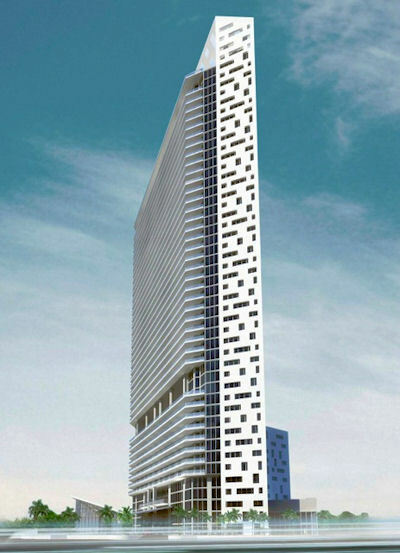 It will have a prime, bayside location in Miami’s Brickell Financial District. 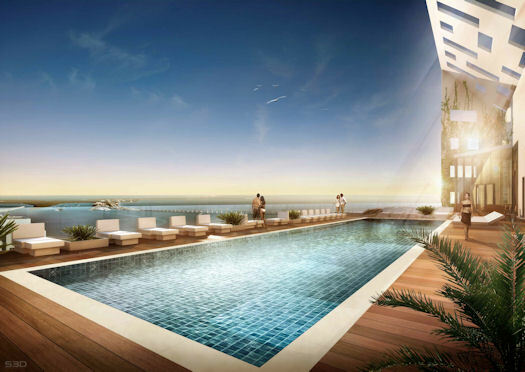 Overlooking downtown and the tranquil waters of Biscayne Bay, BrickellHouse will be a $170 million development comprised of 374 residential condos, ranging from modern studios to 5,000 square foot, exclusive penthouses. BrickellHouse is going to be a new lifestyle experience. For a hassle-free life, residents will benefit from an in-house maintenance program, an in-house, short-term rental program, and a concierge program. BrickellHouse brings new meaning to the term state-of-the-art. Sophisticated and smart, it offers more than just inspiring open layouts and high-end finishes but many high-tech conveniences as well. The condo residences will have advanced smart building wiring for HD TV, multiple telephone/data lines, ultra high-speed internet access, plus a wealth of green features that help minimize the building’s carbon footprint. 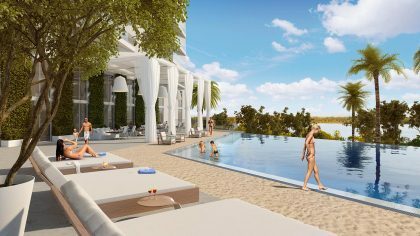 Residences will also sport expansive private balconies, offering views of Biscayne Bay and the Brickell Financial District. They’ll also have gourmet kitchens and bathrooms with walk-in wardrobe closets, imported European cabinetry, and premium appliances. BrickellHouse will provide a flexible living program that offers property management services for a variety of scenarios, whether residents want to live there year round, only part of the time, or place it in the professionally managed leasing program. BrickellHouse is located just one block off prestigious Brickell Avenue in the center of Miami’s financial district. Over the past few years, this area has transformed itself into a highly desirable, pedestrian-friendly area. The BrickellHouse neighborhood features dozens of high-end restaurants, lounges, hotels and shops all within a few blocks. The Mary Brickell Village dining and retail district and the now underway Brickell CitiCentre mixed-use project are both a short walk away. Multiple public transit options connect BrickellHouse with Miami’s star attractions, including the American Airlines Arena, Adrienne Arsht Center for the Performing Arts, Miami Art Museum and Miami Science Museum in Museum Park, and Bayfront Park. Miami International Airport is located less than 10 miles away and will soon be accessible by public transportation as well. BrickellHouse is being developed by Newgard Development, which has spent 30 years directly involved in the South Florida multi-family real estate market with team projects including Solaris in Brickell and City Palms in downtown West Palm Beach. Sieger Suarez Architectural Partnership, architects of well-known properties such as The St. Regis Bal Harbour, ICON Miami Beach and Trump International Sonesta Beach Resort in Sunny Isles, is the building’s design architect. Nationally-renowned Yabu Pushelberg and Artefacto are overseeing interior design components. Sieger Suarez Architectural Partnership, architects of well known properties such as The St. Regis Bal Harbour, ICON Miami Beach and Trump International Sonesta Beach Resort in Sunny Isles, is serving as the building’s design architect. 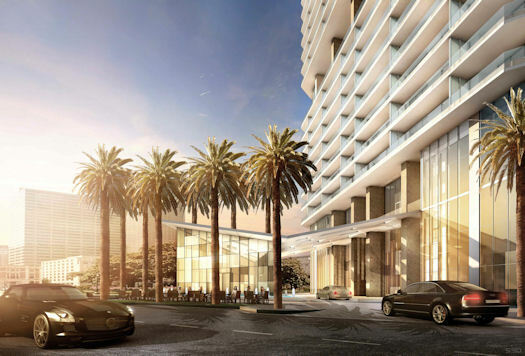 Nationally renowned Yabu Pushelberg (designer of the Trump Hollywood, whose lobby is featured on the right) and Artefacto are overseeing interior design components. You’ve seen me mention downtown Miami quite a lot the past few months. It’s a blazing hot market, and I’m not just talking about the weather. Less than 10% of the 23,000 new condos built in the last real estate boom, 2005-2008, remain available today. As international buyers from Latin America, Canada, Europe and the northeast United States have gobbled up the supply of new inventory, developers are now preparing to launch the next wave of condo towers. BrickellHouse will be one of the first to come out of the ground. The benefit of getting in on a preconstruction opportunity like this is you can be among the first to select the best condos, with the best views, at the lowest prices. To avoid the same situation that occurred in the last housing boom, BrickellHouse is targeted at investors planning to live in their homes or rent them out. Buyer payments are structured to discourage the speculative-type buyers who purchased Miami condos in 2006 with little down and then walked away when the market crashed. BrickellHouse will require buyers to pay 70% of their purchase price as new construction milestones are met, with the balance coming at closing. 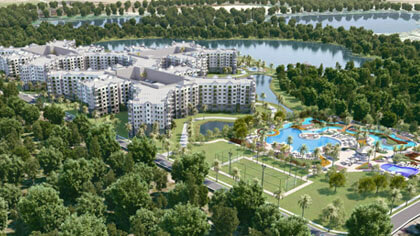 However, only 10% is required at this time in order to reserve a condo. While this payment plan could be a hardship for some buyers in need of financing, it will ultimately create a stronger, more fiscally healthy development. This is the program many developers are now following. Personally, I’m excited to see new activity in downtown Miami with this more conservative financing approach. What I also like are the realistic pre-construction sale prices, which start below $200,000. 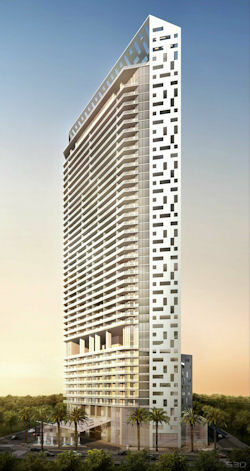 Groundbreaking on BrickellHouse will take place in spring 2012. 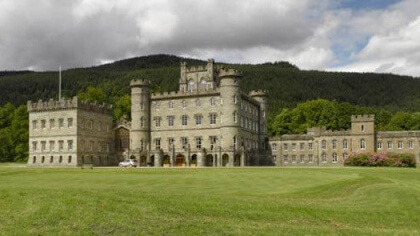 Construction is expected to begin by July and be completed within two years in 2014. I have lots more information on BrickellHouse , which I’m happy to share in my detailed data sheet. To receive it immediately, you just need to provide your name and contact information, per the developer’s requirements. Request the BrickellHouse data sheet here. Of course, BrickellHouse is not our sole property offering, although it is the only one that will have a super cool parking garage. If you’d like to see what else we have available in Miami or elsewhere, pre-construction or already built, please check out our Featured Properties. As always, thank you for your interest in the properties we showcase at Condo Hotel Center. Have a nice day.